This work is not the first to discuss models for cropland valuation – typical techniques divide into calculating net present value and/or real returns (e.g. Burt, 1986; Hanson and Myers 1995) or hedonic models which explain values as a set of contributory components similar to looking at ‘comparables’ in residential real estate with adjustments for differences in characteristics across different sales (Roka and Palmquist, 1997; Bastian et al. 2002). No matter the approach taken, the fundamental productivity of the land, often summarized in a measure of soil quality, is the primary factor in most models. Additional elements including distance to population centers and potential development pressure, distance to grain markets and associated basis, and non-farm amenities also impact values. However, crop production potential remains a key feature and the feature most correlated with soil quality. While many states have developed rather advanced soil classification and productivity measurement scales, there is not a single common index used across multi-state regions and some standardization is thus necessary in order to compare price impacts across broad regions. 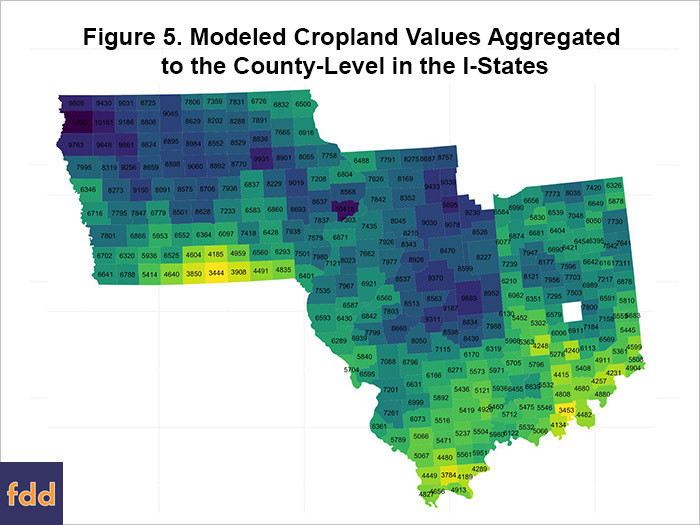 The data publicly tabulated at AcreValue provide a means to assess the wide variation in soil quality indices used in different states, and a mechanism to standardize to some degree the price relatives for cropland by soil productivity class. In the three ‘I’ states of Iowa, Illinois, and Indiana, it is common for the range from the top producing soils to the lowest cropped soils to result in roughly double yields, double prices, and double the ‘dollars per productivity point’. This relationship has also been repeatedly confirmed in the annual publication from the Illinois Society of Professional Farm Managers and Rural Appraisers whose commentaries have also provided similar estimates. The following maps provide estimates of current farmland values in each county in terms of the price in dollars per PI point where the PI point is converted to the percentile of land quality in the state. For example, the most Northwestern county in Illinois (Jo Daviess) has values at approximately $60 per standardized PI point compared to $73 in Lake County at the North eastern tip. The subsequent maps show similar information for Iowa and Indiana in the left and right panels of figure 1. However, the actual soil productivity indices used by each state are unfortunately not consistent. 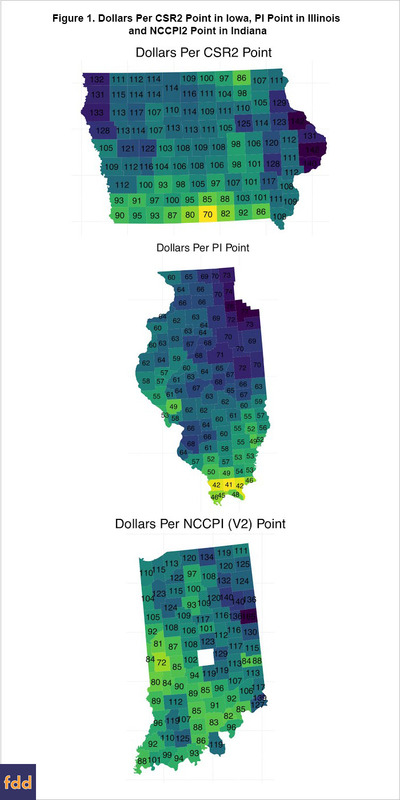 The SPI scale most commonly used in Illinois ranges from 0-147, with most cropped land at about 80 and above, CSR2 in Iowa ranges from 5-100, and NCCPI2 in Indiana varies from 0-100. A measure known as NCCPI2 does exist nationally in the United States, but it is generally regarded as less reliable than locally-produced indices of soil productivity, and it has some adjustments for climate factors making it more difficult to compare across regions as the same value may connote different productivities in different locations. Using a very simple technique of assigning percentile scores to each county within each state for that state’s soil index results in a simple transformation that provides a common relative measure of productivity, at least within each state. On this scale, a 50 for example would indicate that half of the remaining soil in the state is more productive, and half less. A 90 would indicate that the soil is more productive than 90% of the other soil in the state. It is important to recognize that this transformation doesn’t result in identical scales across states, but still provides a useful means to depict other related features. 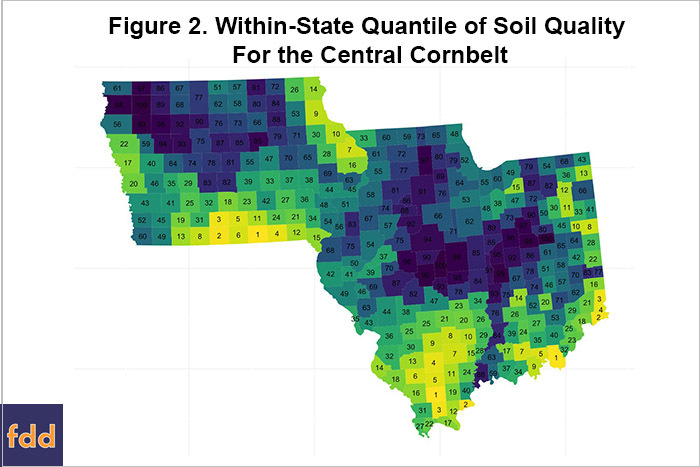 Figure 2 shows the distribution of within-state soil quantiles of soil quality (or the fraction of other land that is below that level PI). This map is not surprising for those familiar with the soil morphology of the Midwest – the glacial tills of the Des Moines lobe protrude down from Minnesota, and the loess and drift in Central Illinois extend into Central Indiana. A slightly surprising artifact though is along the Illinois/Indiana state line where the Wabash River appears to divide better Indiana soils from worse Illinois Soils, where in fact these are part of the same major land resource area – this artifact comes from the disparate scale issue as mentioned above. For example a Xenia Silt Loam with 2-5% slope is assigned a PI of 116 in Illinois, which is about the 63rd percentile by map unit, has an NCCPI2 of 75 and is in the 73rd percentile of Indiana map units. It is also interesting to examine the dollars per soil quality point by percentile to help identify location effects and attributes other than soil quality that affect value. Figure 3 shows this tabulation and corresponds to the general pattern in figure 1, areas along the rivers in Iowa, closer to Chicago in Illinois, and to the in Northeast in Indiana, as expected, have the highest values per unit of soil quality. One important feature of the model used to come to these figures is that one can examine other factors that led to the estimated value of land across counties. While the relatively simple model used here takes into account a number of climatic variables as well as population density, economic attributes, for example, local basis and tax levies explain a large proportion of the remaining variation once soils are taken into account. 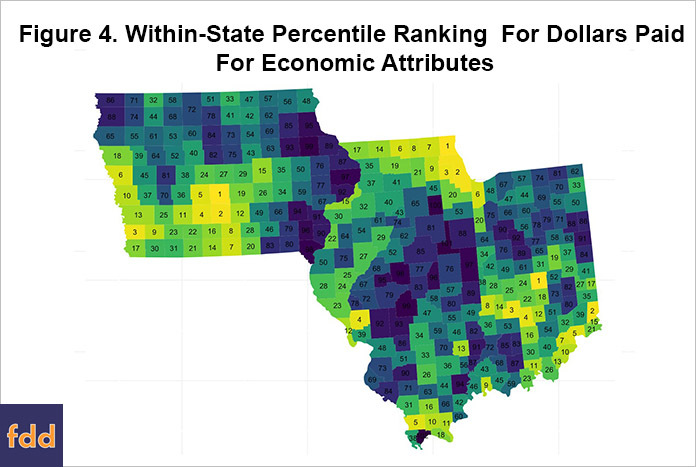 Below is a map of the within-state percentile of dollars paid for economic attributes in the model that are separate from the farm income effects alone. Here it can be seen that excluding highly populated areas (the Chicago metro, Des Moines, Indianapolis) areas of high dollars paid for soil quality align with high dollars spent for economic attributes as would be expected. Putting these together as well as adding in information about the non-economic, non-soil attributes, we get estimates of the values for land on a per-county aggregate basis for the beginning of 2016. While there are a number of ways of modeling cropland values, hedonic models based on a number of prominent factors that drive productivity and revenue can powerful tools to distinguish patterns across a landscape. 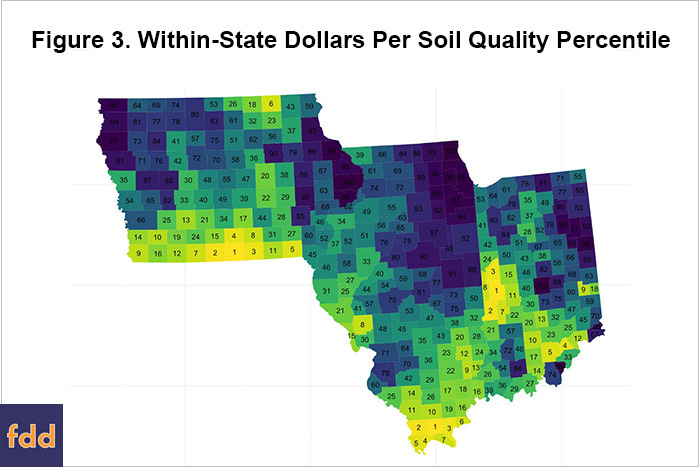 Looking at nearly raw data, using dollars per soil quality point can be a poor estimator, as this varies by over 25% in adjacent counties in each of the three ‘I’ states and by a factor of around two in each as well, with the least variation in Illinois and most in Indiana. Differences in economic attributes can explain much of this variance. Examining variations in local crop price basis and tax rates should necessarily supplement the decision-making process of any savvy grower or investor. Bastian, Chris T., et al. "Environmental amenities and agricultural land values: a hedonic model using geographic information systems data." Ecological Economics (2002): 337-349. Burt, Oscar R. "Econometric modeling of the capitalization formula for farmland prices." American Journal of Agricultural Economics (1986): 10-26. Dobos, R. R., H. R. Sinclair, and K. W. Hipple. "National Commodity Crop Productivity Index (NCCPI) user guide v2.0." USDA NRCS National Soil Survey Center, Lincoln, NE. (2012). Hanson, Steven D., and Robert J. Myers. "Testing for a time-varying risk premium in the returns to US farmland." Journal of Empirical Finance 2.3(1995): 265-276. Roka, Fritz M., and Raymond B. Palmquist. "Examining the use of national databases in a hedonic analysis of regional farmland values." American Journal of Agricultural Economics (1997): 1651-1656.